Comitán is the fourth-largest city in the Mexican state of Chiapas. Start off your visit on the 10th (Tue): explore the activities along Lagunas de Montebello and then take in the dramatic scenery at Cascada El Chiflon. For where to stay, traveler tips, reviews, and other tourist information, go to the Comitan trip planner. Ottawa, Canada to Comitan is an approximately 20.5-hour flight. Traveling from Ottawa to Comitan, you'll gain 1 hour due to the time zone difference. Finish your sightseeing early on the 11th (Wed) so you can travel to San Cristobal de las Casas. San Cristóbal de las Casas, also known by its native Tzotzil name, Jovel, is a town and municipality located in the Central Highlands region of the Mexican state of Chiapas. Your inner history buff will appreciate Church of St. Juan Bautista and Yaxchilan. Your cultural itinerary includes sights like Centro de Textiles del Mundo Maya and Asociación Cultural Na Bolom. The adventure continues: add some adventure to your tour with a kayaking and canoeing tour, see the interesting displays at Museo del Ambar, take in nature's colorful creations at Orquideas Moxviquil, and stop by AMBAR - Taller y Joyeria - Lagrimas de la Selva. To find other places to visit, where to stay, maps, and more tourist information, use the San Cristobal de las Casas itinerary planner. Explore your travel options from Comitan to San Cristobal de las Casas with the Route module. Wrap up your sightseeing by early afternoon on the 13th (Fri) to allow enough time to travel to Oaxaca. Capital city of the eponymous state, Oaxaca relies heavily on its colonial charm, its core a maze of tree-shaded alleys flanked by photogenic mansions, government buildings, and old churches. On the 14th (Sat), explore and take pictures at Amigos del Sol, then explore the world behind art at Museo Rufino Tamayo, then take in the spiritual surroundings of Cathedral of Oaxaca, and finally make a trip to Andador de Macedonia Alcala. Get ready for a full day of sightseeing on the 15th (Sun): see the interesting displays at Museo Textil de Oaxaca, see the interesting displays at Museo de Filatelia de Oaxaca, A.C., then take in the spiritual surroundings of Basilica de la Soledad, and finally trek along Pueblos Mancomunados. For maps, traveler tips, photos, and other tourist information, go to the Oaxaca trip itinerary builder. Do a combination of bus and flight from San Cristobal de las Casas to Oaxaca in 4 hours. Alternatively, you can drive; or take a shuttle. Expect a daytime high around 32°C in January, and nighttime lows around 11°C. Wrap up your sightseeing on the 16th (Mon) to allow time to drive to Puerto Escondido. Puerto Escondido is a small port and tourist center in the municipality of San Pedro Mixtepec Distrito 22 in the Mexican state of Oaxaca. Take a break from the city and head to Playa Bacocho and Puerto Angelito. Discover out-of-the-way places like Playa Principal and Safaris. Next up on the itinerary: tour the pleasant surroundings at Playa Zicatela, look for gifts at Central Surf Shop, explore the activities along Laguna de Manialtepec, and kick back and relax at Playa Marinero. To find reviews, more things to do, where to stay, and more tourist information, read our Puerto Escondido online itinerary creator. Getting from Oaxaca to Puerto Escondido by car takes about 4.5 hours. Other options: take a bus. Traveling from Oaxaca in January, expect much warmer with lows of 26°C in Puerto Escondido. Finish your sightseeing early on the 20th (Fri) to allow enough time to travel to Mazunte. Kick off your visit on the 20th (Fri): contemplate the waterfront views at Laguna Ventanilla, let the river carry you with a rafting and tubing tour, and then get great views at Punta Cometa. Here are some ideas for day two: kick back and relax at Bahia Estacahuite and then enjoy the sand and surf at Zipolite. For other places to visit, traveler tips, and tourist information, use the Mazunte tour planner. Explore your travel options from Puerto Escondido to Mazunte with the Route module. 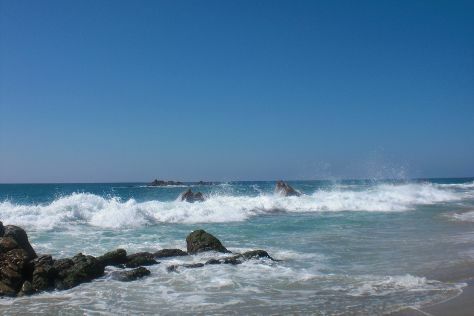 January in Mazunte sees daily highs of 36°C and lows of 24°C at night. Finish up your sightseeing early on the 21st (Sat) so you can travel to Huatulco. A short flight from Mexico City, scenic Huatulco features nine picture-perfect bays on the Pacific coast. 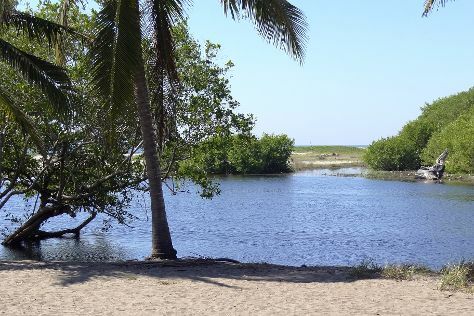 We've included these beaches for you: Cacaluta and Playa La Bocana. Explore hidden gems such as Hagia Sofia and Playa San Augustin. There's lots more to do: take in the dramatic scenery at Magic Falls, cast your line with a fishing tour, contemplate the waterfront views at Santa Cruz Bay, and stop by Maica Silver & Contemporary Bijoux. For photos, where to stay, maps, and other tourist information, you can read our Huatulco online itinerary creator. The Route module can help you plan travel from Mazunte to Huatulco. In January, daily temperatures in Huatulco can reach 36°C, while at night they dip to 24°C. Finish up your sightseeing early on the 25th (Wed) so you can travel back home.